Romance is in the air can you feel it? Valentines day sparks nostalgic visions of flowers, chocolate hearts and love. A Segue holiday from the ending winter to forth-coming promise of Spring. Valentines Day also marks one of the bloodiest days of Chicago Gang land violence. The St. Valentines Day massacre occurred February 14th, 1929 in the S-M-C Cartage Co, located at 2122 North Clark Street (Chicago). Prohibition was conceived in good will. The idea was to improve society from the ill will effects of alcoholism. Prohibition in the United States focused on the manufacture and sale of alcohol. The act of drinking liquor itself was never made illegal by the U.S. Federal Government. Evangelical protestant churches, the Women’s Christian Temperance Union and Anti Saloon League pushed for regulation and control of alcohol. They believed outlawing liquor would protect families, women and children from the unwanted effects of serious alcohol abuse. The United Stated of America was founded by liquor, in one sense. It was far safer to drink alcohol, than the natural water sources available. Early Americans drank alcohol from the time they awoke, to the time they went to bed. Over time safe water sources became abundant, but alcoholism had already become an epidemic disease. Prohibition opened the doorway to modern American Organized Crime syndicates. Illegal alcohol sales, could be found in speakeasy’s’ also called a blind pigs or blind tigers, in every city in America. These “underground” bars continued the untaxed sales of illegal alcohol. Organized crime was focused on the illegal import, manufacture, and sale of alcohol. Probation was a godsend to organized crime. Every gang wanted their cut of the profits. The struggle and control of illegal liquor sales reached critical mass February 14, 1929 Valentines Day. The events that transpired that day had roots five years the earlier in November of 1924. Chicago had been divided into the North Siders, run by O’Banion; and the south side Outfit, which was controlled by Johnny Torrio and good guy, Al Capone. That November Torrio ordered the assassination of O’Banion and soon hell broke loose in the streets of Chicago. The North Siders seeking revenge nearly killed Torrio outside his house. Torrio as a result, turned over all criminal operations to Al Capone, and left town. Hymie Weiss briefly ran the North Siders till Capone gun men ended his life. George “Bugs” Moran, a long-time enemy of Capone became the heir apparent to the North Side crew. A Mob War was in full effect. It is believed, Al Capone distanced himself to Miami Florida just prior giving orders, for Moran’s Murder and thus linking Capone to a murder in Chicago from Miami would prove difficult. Capone had a very special “valentine” that we wanted delivered to Moran. Adam Heyer, a friend of Moran, owned S-M-C Cartage Co. at 2122 North Clark Street. Capone via unknown contacts made Moran aware that a special shipment of hijacked whiskey was going to be delivered to the garage at 2122 North Clark Street. On the morning of February 13 Moran arranged to be there to meet the truck the next day. The rest as they say is history. Johnny May, a German Shepherd named Highball, Frank and Pete Gusenberg, James Clark, Adam Heyer, Al Weinshank, and Reinhardt Schwimmer waited in the garage for the meet up. Moran had been late all morning. A police car had parked outside the garage. Moran spotted the police car and drove off, to avoid a possible shakedown and continued to the next street for a cup of tea. Five men eventually left the police cruiser and entered the garage. Two of the men were in police uniforms, the other three were in regular attire. A moment of machine gun clatter took place and then silence. In total 7 men were violently massacred execution style with their backs against the wall. 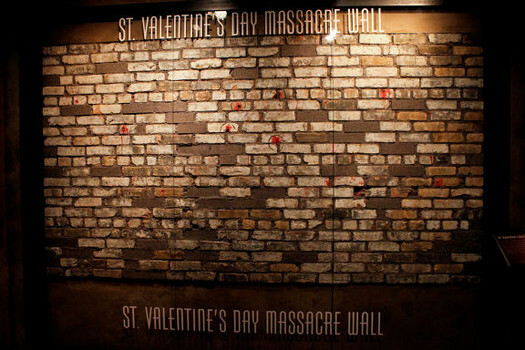 The St. Valentine’s Day Massacre ended with Al Capone in sole control of bootleg operations in Chicago. The violence erupting out of Chicago was now a topic of National concern. Al Capone would soon become, “Public Enemy Number One”. Al Capone would end up serving 8 months of a one year sentence, in Eastern State Penitentiary. While incarcerated, Capone’s mental status was in question as he believed he was being haunted by the ghost of James Clark, one of the massacre victims. Inmates would later proclaim that they could hear Capone screaming in his cell, begging “Jimmy” to go away and leave him alone. Upon release, Capone continued to believe he was plagued by the ghost of James Clark. He even enlisted a psychic named Alice Britt to get rid of Clark’s angry spirit. In the days, months, and years following the St. Valentine’s Day Massacre, the S-M-C Cartage Co. at 2122 North Clark Street became a hot spot for tourists. Eventually ownership of the garage changed hands. In 1949, new owners opened an antique furniture business. The couple that owned the business later recounted, that the building may have been haunted. Eventually the business closed in 1967 and the building was finally demolished. Canadian entrepreneur George Patey purchased the bullet ridden bricks that lined the garage wall just prior to demolition. In 1972 he opened a roaring twenties themed nightclub and used the bricks as part of the men’s restroom wall. In time the club closed. Patey placed the 400 plus bricks into storage. He would later offer them for sale with a written account of the massacre at a price of $1000 each. Unfortunately for patty the bricks were being returned as fast as they are being sold. It is believed, that anyone who purchased one of the bricks met with bad luck; manifesting in the form of illness, financial disaster, divorce and even death. According to the ill fated buyers, the bricks were a powerful source of negative energy, emanating from the St. valentine’s day massacre. Clark street is believed to be haunted. Passerby’s and witnesses claim to have heard screams, and machine gun fire. Other inexplicable noises and a feeling of dread have also, been witnessed.